This page is a trouble shooter for the various coolant systems used on the Ford Scorpio and it is intended to help the owner locate and deal with coolant leaks. The coolant circuit on all of the Scorpio engines are closed-systems. They are not exposed to the outside air, but use an expansion tank sealed with a lift-off pressure cap to allow for expansion and contraction of the coolant. This minimises losses through evaporation, so any lowering of the coolant level inside the tank should be investigated quickly before damage occurs elsewhere. If you are constantly topping-up the coolant there must be a leak - however, finding it is not always easy. Water Pump spindle - as the water pump is spinning it needs a sealed bearing, or gland, to allow the shaft to rotate yet keep in the coolant. This shaft and the gland wears over time, and finally the coolant will escape through an expansion hole on the underside of the spindle. Quite often this coolant is thrown outwards by the pulley so that a line of coolant/rust is visible across the front of the engine bay. Cosworth owners - be aware that the water pump spindle bearing on the Cosworth should be fitted with a small pipe that carries any leakage away from the front pulley, so look for this first. Be aware that clear water can drip down behind the engine from the evaporator drain tubes when the AC or CC is on during humid days. This is moisture extracted from the air entering the cabin through the evaporator and is often seen as a puddle after parking for a while after a run. I have been approached many times by helpful people in car parks who have pointed this out to me, thinking that this is a coolant leak - do not be alarmed, it is quite normal. This drip of clear water may also cause a hiss noise as it drops onto the very hot catalyst after run. Look for leakage along the seams and the vanes of the radiator and along the bottom. Laying underneath the car looking upward with the aid of a torch you should be able to inspect the front of the radiator behind the airconditioning condenser. Cosworth Owners - if you see the radiator 'ballooning' - that is, showing signs of swelling along the vanes particularly along the bottom, then you are another victim of this syndrome. We recommend that you take the time to change the thermostat when you replace the radiator, or this may happen again. You might not be aware that on V6 engines there is an oil/coolant heat exchanger mounted on the offside of the engine block included in the oil filter housing. Since coolant always flows through the heater matrix on the Scorpio, (it is the heater doors that close off the heat) this exchanger brings the oil up to temperature quickly, then stabilises the oil temperature so that even on the hottest days the oil stays at about the same temperature as the coolant. Two hoses lead from this housing, one from the heater matrix and the other from the the main bottom radiator hose. The figure below illustrates this - the heat exchanger is the item on the left end of the hose T-piece on (3). One owner reported that this hose had deteriorated and needed to be replaced. Hoses (5) and (6) allow any air bubbles to escape from the circuit into the air space in the expansion tank and if these are blocked (normally at the expansion tank flanges) then the system will be difficult to fill. Some owners have reported that the radiator flange for the hose (6) is missing, and the hose left to trail down the side of the radiator. 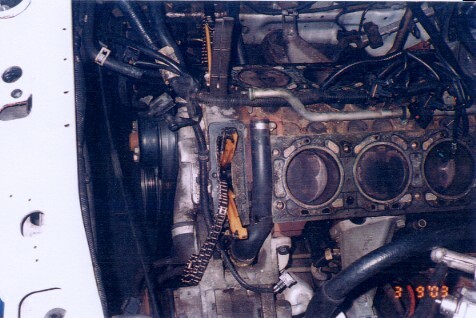 At some stage the correct radiator with this connection has been replaced with the Granada radiator: the hose (6) has nothing to connect to and has been left to the air. Since the hose is connected to the air space in the expansion tank this will normally work, but there will be coolant losses because of evaporation and the ability of the system to remove air locks will be impaired. Visible checks of the hoses, both above and below the engine should be enough to determine whether any are leaking. Where there are weaknesses allowing very small amounts of coolant to escape, you will see tiny blue crystals accumulating, formed by antifreeze as it meets the air. If there is any slack in the hose, these may be repaired by trimming the hose back slightly and reapplying the hose clip on fresh rubber. You might wonder how it would be possible for coolant to escape without there being some sign, but there are several ways in which the system can lose fluid. During manufacture an engine block is provided with open holes into the water spaces. These are closed with core plugs, dish-shaped metal disks that seal the holes but provide a weak point to enable coolant to expand into ice without cracking the block. If the engine is run for a length of time without the corrosion inhibitors of good anti-freeze, these core plugs can corrode and allow a seepage that will worsen under high temperature conditions. Anti-leak compounds such as Barrs can block the hole for a while but the corrosion continues until the leak becomes too severe to seal. Then - whoosh - it's sauna time! Above, the DOHC engine block. The items marked (9) are the core plugs on the side of the block. These can be checked with a torch from above and below the engine. 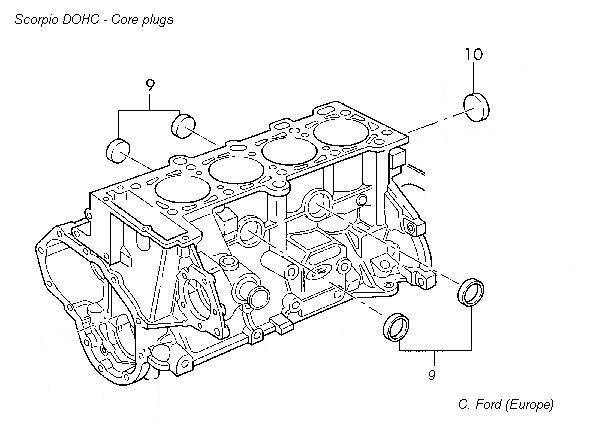 The V6 engine block have much the same core plugs in the same place, except that there are three on each side. But what's this (10) ? Yes, it's another core plug - on the end of the block, right behind where the flywheel or drive plate would be. With the bell housing in place a corroded core plug here could bubble and spit away quite unnoticed, on a manual soaking the clutch driven plate and causing it to judder. On an automatic there will be no sign of it at all, apart from, like the manual transmission, a trace of coolant or rust at the bottom of the bell housing where it joins with the engine block, and probably traces of rust and coolant on the start motor pinion if it is removed. This same contamination can cause the starter pinion to stick. Once the leak becomes severe, when hot and the pressure is high, coolant will run from this flange and will be seen dripping onto the road. A new one only costs about 79 pence, but it needs the gearbox dropping out, the clutch and flywheel removed to get at it. Punch the old one out with a screwdriver, then clean the hole with wet-and-dry, rubbing around the hole, not in and out. Paint the inside of the hole with ordinary oil-based paint, then tap the core plug in using a 22mm socket and a mallet. Drive the core plug into the hole so that it remains square and the paint will help to seal it and to prevent the scratches caused by installing it from corroding all over again. This can be the cause of another invisible leak. It is often accompanied by a curry smell in the interior, and perhaps the windscreen misting up more than usual. Check the carpet over the transmission tunnel under the heater. If it's wet, check the moisture - does it smell of coolant? If not, it might be water from the aircon Evaporator or the battery shelf. If it is coolant you have some work to do, but it is quite possible to carry out the work yourself. When Cosworth redesigned the cylinder heads of the V6 Cologne to a modern pent-roof design, with four valves per chamber and two cams per bank, they raised the BHP from 147 to 207. This obviously enormously increased the heat that had to be dissipated, so a new coolant circuit was added between the cylinder heads, together with a pipe running between the V to provide a flow to the internal heater matrix. Above, the cylinder head cooling arrangement. The water pump is not included. Item (1) is the thermostat and this remains closed while cold so that the coolant is in a closed circuit through the cylinder heads. 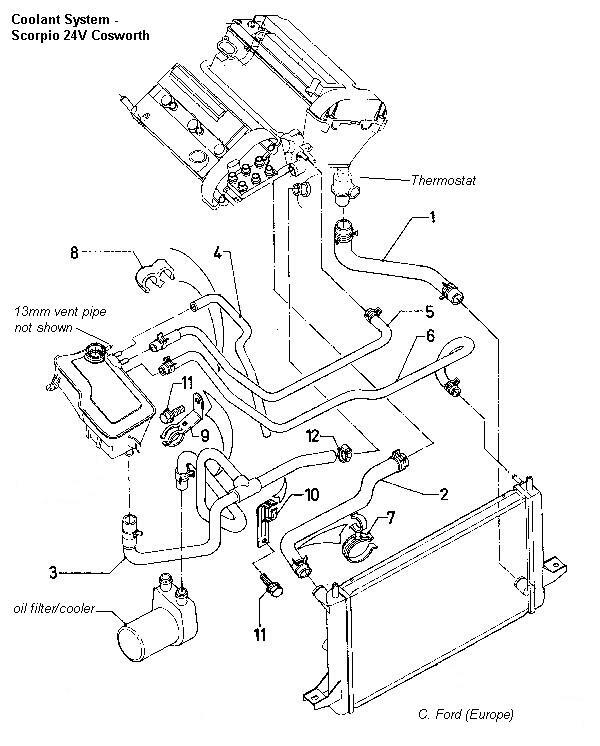 When the required temperature is reached, the thermostat opens and allows coolant to flow through to the radiator, where it is returned to the water pump on the low-pressure side. A weak or sticking thermostat is suspected of causing the ballooned radiators on 24V cars. Item (5) is the coolant supply takeoff for the heater matrix. Sometimes these pipes can corrode and cause a leak, and sometimes the seals (7) can fail, and if this happens there is a smell of hot coolant from the top of the engine, while the engine loom that runs through the V in this location can be effected, causing autobox errors on OBD. If you shine a bright torch down through the inlet system on the right of the centre line you can just see the metal of the bottom of the V. It should be absolutely dry. If it is wet then you must suspect a leak in this area, unless you have pressure-washed the engine - and don't do it again!. Another problem can be the hose marked (12). You will be forgiven for not finding this hose at first - it is attached to the thermostat, which is concealed behind the aircon compressor, and then the hose rises along the dead space at the front under the nearside cylinder head (Bank 2) where it is connected to the water housing (2) with the hose clip (23). The photo below shows this hose with the cylinder head removed. If you ever need to remove the inlet manifold we recommend that you replace this hose, and any other part that shows sign of corrosion while you are there. This would save the additional cost of doing the whole thing all over again! Automatics in the Scorpio range use a secondary radiator at the front of the car for autofluid, and these pipes should be checked regularly for corrosion. However, in order to heat the fluid up quickly, the same auto fluid also goes through a small section of the coolant radiator, on RHD models on the nearside beneath the top radiator hose. It is my experience that the coolant radiator can fail and allow a very small amount of coolant into the auto fluid, probably only in high temperature conditions. Symptoms included a very slow loss of coolant where a leak could not be detected anywhere, rapid and unexplained deterioration of the transmission fluid, followed swiftly by severe gearbox errors. This entire process took only a few months. During the autobox strip down, the specialist found that the brake bands were dissolving and traces of rust had coated the bright steel parts - impossible unless coolant or water had been admitted. Water dissolves the friction material on the brake bands and damages the solenoid seals, and this explained the failure of the autobox in such a short time. The torque converter, every brake band and solenoid had to be replaced - as well as the coolant radiator. If you experience both a very slow loss of coolant that cannot be explained as well as the rapid deterioration of the autobox fluid on the dipstick, then replace the radiator and all of the transmission fluid and filter as a matter of urgency - this may save a lot of money. Sometimes after refilling the coolant system an owner may find that air seems to get trapped in the system. Symptoms include being very slow to refill, overheating and bubbling and boiling over on longer runs. If this is the case check the small bore air pipe(s) on the diagrams above. 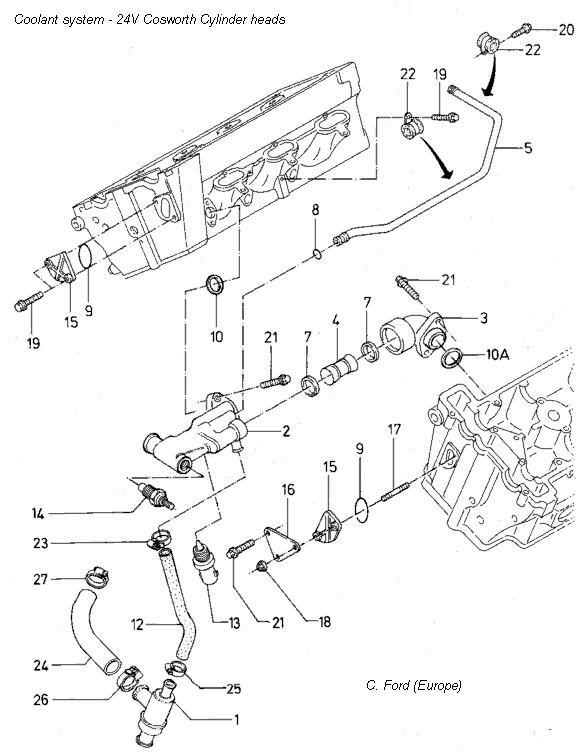 These are connected to the high points of the coolant piping and the air space inside the expansion tank, and if it is blocked air can be trapped inside the cylinder head(s). Check both the pipe and the nylon unions on the tank - make sure they are not blocked with crystals or gunge, especially if the coolant strength has been neglected. No specific concerns with the VM 2.5 TDi coolant system have been identified. 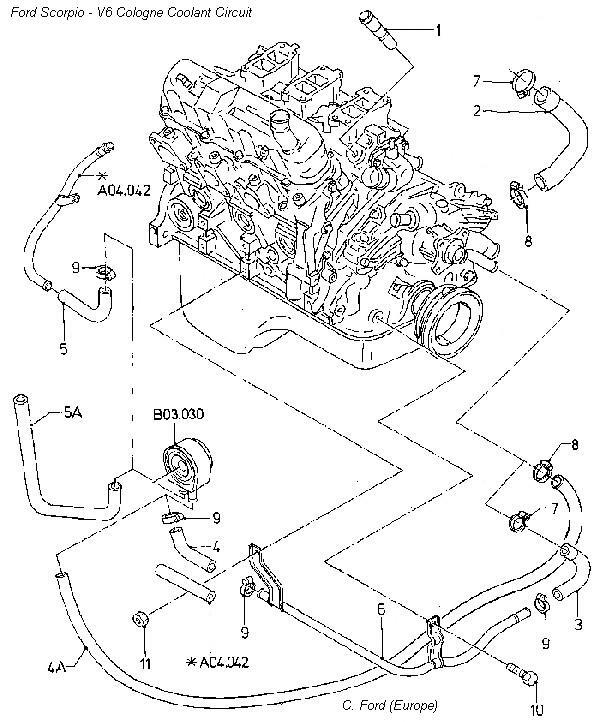 The exploded diagrams for this engine do not show any core plugs in the engine block.